Stratification, Inequality, and Social Class in the U.S.
Society is stratified into social classes on the basis of wealth, income, educational attainment, and occupation. There are competing models for thinking about social classes in the U.S. — most Americans believe in a three tier structure that includes the upper, middle, and lower classes, but popular variations delineate an upper-middle class and a working class. Individuals tend to form relationships with others in their own class, and to consequently acculturate to, or learn the values of behaviors of, their own class. This process strengthens distinctions between classes as each group establishes a unique class culture. Due to class mobility, in some cases individuals may also acculturate to the culture of another class when ascending or descending in the social order. social network: The web of a person’s social, family, and business contacts, who provide material and social resources and opportunities. acculturate: To acquire the culture (including systems of value and belief) of the society that one inhabits, starting at birth. Class Culture: A system of beliefs, values, and behaviors that is particular to a socioeconomic group. Most social scientists agree that society is stratified into a hierarchical arrangement of social classes. Social classes are groupings of individuals in a hierarchy, usually based on wealth, educational attainment, occupation, income, and membership in a subculture or social network. Social class in the United States is a controversial issue, having many competing definitions, models, and even disagreements over its very existence. Many Americans believe in a simple three-class model that includes upper class, the middle class, and the lower class or working class. More complex models that have been proposed by social scientists describe as many as a dozen class levels. United States Social Classes: While social scientists offer competing models of class structure, most agree that society is stratified by occupation, income, and educational attainment. Meanwhile, some scholars deny the very existence of discrete social classes in American society. In spite of debate, most social scientists agree that in the U.S. there is a social class structure in which people are hierarchically ranked. Elsewhere in the world, one’s social class may depend more upon race/ethnicity, position at birth, or religious affiliation. For example, in Mexico, society is stratified into classes determined by European or indigenous lineage as well as wealth. In the U.K. class position depends somewhat on family lineage, with members of the nobility traditionally belonging to the aristocracy. Social class is sometimes presented as a description of how members of society have sorted themselves along a continuum of positions varying in importance, influence, prestige, and compensation. Thought of this way, once individuals identify as being within a class group they begin to adhere to the behaviors they expect of that class. Thus, a person who considers him or herself to be upper class will dress differently from a person who considers him or herself to be working class — one may wear a business suit on a daily basis, while the other wears jeans, for example. By adhering to class expectations, individuals create sharper distinctions between classes than may otherwise exist. Sociologists studying class distinctions since the 1970s have found that social classes each have unique cultural traits. The phenomenon, referred to as class culture, has been shown to have a strong influence on the mundane lives of people, affecting everything from the manner in which they raise their children, to how they initiate and maintain romantic relationships, to the color in which they paint their houses. The overall tendency of individuals to associate mostly with those of equal standing as themselves has strengthened class differences. Because individuals’ social networks tend to be within their own class, they acculturate to, or learn the values and behaviors of, their own class. Due to class mobility, in some cases individuals may also acculturate to the culture of another class when ascending or descending in the social order. Nonetheless, the impact of class culture on delineating a social hierarchy is significant. Property is the total of one’s possessions and, therefore, may be a better measure of social class than income. Property goes beyond income as a measure of social class as it reflects the accumulated wealth (e.g., homes, stocks, bonds, savings) in addition to one’s earning potential. Private property is distinguishable from public property and collective property, which refers to assets owned by a state, community, or government rather than by individuals or a business entity. Economic liberals consider private property to be essential for the construction of a prosperous society. Socialists view private property relations as limiting the potential of productive forces in the economy. Libertarians believe that private property rights are a requisite for rational and efficient economic calculation. libertarian: A believer in a political doctrine that emphasizes individual liberty and a lack of governmental regulation and oversight both in matters of the economy (‘free market’) and in personal behavior. economic liberals: Economic liberalism is the ideological belief in organizing the economy on individualist lines, such that the greatest possible number of economic decisions are made by private individuals and not by collective institutions. Property refers to the sum total of one’s possessions, as well as their regular income. It goes beyond income as a measure of social class, as it reflects wealth accumulated (e.g., homes, stocks, bonds, savings) in addition to one’s earning potential. Property is a better overall measure of social class than income, as many individuals who are considered wealthy actually have very small income, and those with less property tend to have less power and prestige. Income: Income is one form of property, and contributes significantly the measures of wealth. In the United States, the top 1% of the population earns a disproportionate amount of national income, coinciding with their position at the top of the social class hierarchy. Private property is the ownership, control, employment, ability to dispose of, and bequeath land, capital, and other forms of property by persons and privately owned firms. Private property is distinguishable from public property and collective property, which refers to assets owned by a state, community, or government rather than by individuals or a business entity. The concept of property is not equivalent to that of possession. Property and ownership refer to a socially constructed circumstance conferred upon individuals or collective entities by the state, whereas possession is a physical phenomenon. Economic liberals consider private property to be essential for the construction of a prosperous society. They believe private ownership of land ensures the land will be put to productive use and its value protected by the landowner. If the owners must pay property taxes, this forces the owners to maintain a productive output from the land to keep taxes current. On the other hand, socialists view private property relations as limiting the potential of productive forces in the economy. They believe private property becomes useless when it concentrates into centralized, socialized institutions based on private appropriation of revenue until the role of the capitalist becomes redundant. Lastly, libertarians believe that private property rights are a requisite for rational economic calculation, and that without clearly defined property rights, the prices of goods and services cannot be determined in an “efficient” manner, making the most efficient economic calculation impossible. Power refers to someone’s ability to get others to do his or her will, regardless of whether or not they want to. Legitimate power, power given to individuals willingly by others, is called ” authority “. Illegitimate power, power taken by force or the threat of force, is called ” coercion “. Coercion is power taken by force or the threat of force. Influence, in contrast to coercion, refers to the means by which power is used. Because power operates both relationally and reciprocally, sociologists speak of the balance of power between parties to a relationship. All parties to all relationships have some power. coercion: Actual or threatened force for the purpose of compelling action by another person; the act of coercing. influence: An action exerted by a person or thing with such power on another to cause change. Power can be seen as evil or unjust, but the exercise of power is accepted as endemic to humans as social beings. The use of power need not involve coercion (force or the threat of force). At one extreme, it more closely resembles what everyday English-speakers call “influence,” or the means by which power is used. Although power can be seen as various forms of constraint on human action, it can also be understood as that which makes action possible, although in a limited scope. Because power operates both relationally and reciprocally, sociologists speak of the balance of power between parties to a relationship. All parties to all relationships have some power. The sociological examination of power concerns itself with discovering and describing the relative strengths–equal or unequal, stable, or subject to periodic change. Sociologists usually analyze relationships in which the parties have relatively equal or nearly equal power in terms of constraint rather than of power. Prestige refers to the reputation or esteem associated with one’s position in society, which is closely tied to their social class. Prestige used to be associated with one’s family name, but for most people in developed countries, prestige is now generally tied to one’s occupation. Highly skilled occupations tend to have more prestige associated with them than low skill occupations. Prestige is often related to the other two indicators of social class – property and power. Prestige is an important element in social mobility. occupation: A regular activity performed in exchange for payment, including jobs and professions. social class: A group of people in a stratified hierarchy, based on social power, wealth, educational attainment, and other criteria. prestige: A measure of how good the reputation of something or someone is, or how favorably something or someone is regarded. Prestige refers to the reputation or esteem associated with one’s position in society. A person can earn prestige by his or her own achievements, which is known as achieved status, or they can be placed in the stratification system by their inherited position, which is called ascribed status. For example, prestige used to be associated with one’s family name (ascribed status), but for most people in developed countries, prestige is now generally tied to one’s occupation (achieved status). Occupations like physicians or lawyers tend to have more prestige associated with them than occupations like bartender or janitor. An individual’s prestige is closely tied to their social class – the higher the prestige of an individual (through their occupation or, sometimes, their family name), the higher their social class. Prestige is often related to the other two indicators of social class – property and power. A Supreme Court justice, for example, is usually wealthy, enjoys a great deal of prestige, and exercises significant power. In some cases, however, a person ranks differently on these indicators, such as funeral directors. Their prestige is fairly low, but most have higher incomes than college professors, who are among the most educated people in America and have high prestige. Prestige is a strong element in social mobility. On the one hand, choosing certain occupations or attending certain schools can influence a person’s level of prestige. While these opportunities are not equally available to everyone, one’s choices can, at least to a limited extent, increase or decrease one’s prestige, and lead to social mobility. On the other hand, certain elements of prestige are fixed; family name, place of birth, parents’ occupations, etc., are unchangeable parts of prestige that cause social stratification. 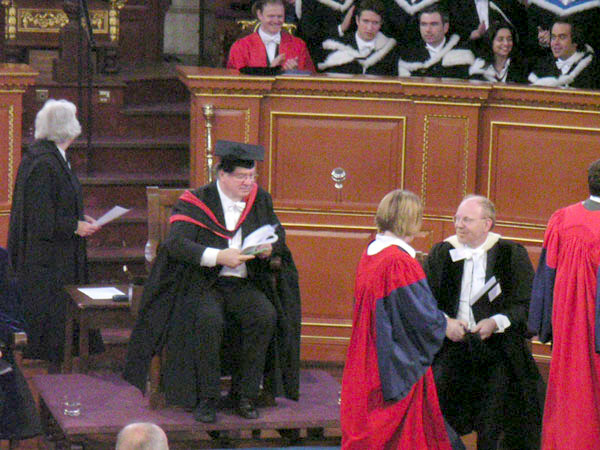 Oxford University Ceremony: The job of professor is an example of an occupation that has high prestige even though many professors do not earn incomes in the top economic bracket. Status inconsistency occurs when an individual’s social positions are varied and these variations influence his or her overall social status. Introduced by the sociologist Gerhard Lenski in the 1950s, status inconsistency theories predict that people whose status is inconsistent will be more frustrated and dissatisfied than people with consistent statuses. Sociologists investigate issues of status inconsistency in order to better understand status systems and stratification. Max Weber articulated three major dimensions of stratification in his discussion of class, power, and status. sociologist: A social scientist focused on the study of society, human social interaction, and the rules and processes that bind and separate people not only as individuals, but as members of associations, groups and institutions. status inconsistency: A situation in which an individual’s varied social positions can have both positive and negative influences on his or her social status. Status inconsistency is a situation where an individual’s social positions have both positive and negative influences on his or her social status. Introduced by the sociologist Gerhard Lenski in the 1950s, status inconsistency theories predict that people whose statuses are inconsistent will be more frustrated and dissatisfied than people with consistent statuses. For example, a teacher may have a positive societal image (respect, prestige, etc. ), which increases her status but she may earn little money, which simultaneously decreases her status. All societies have some basis for social stratification, and industrial societies are characterized by multiple dimensions to which some vertical hierarchy may be imputed. The notion of status inconsistency is simple: It is defined as occupying different vertical positions in two or more hierarchies. Sociologists investigate issues of status inconsistency in order to better understand status systems and stratification, and because some sociologists believe that positions of status inconsistency might have strong effects on people’s behavior. Max Weber articulated three major dimensions of stratification in his discussion of class, power, and status. This multifaceted framework provides the background concepts for discussing status inconsistency. Status inconsistency theories predict that people whose status is inconsistent, or higher on one dimension than one another, will be more frustrated and dissatisfied than people with consistent statuses. Gerhard Lenski originally predicted that people suffering from status inconsistency would favor political actions and parties directed against higher status groups. According to Lenski, the concept can be used to further explain why status groups made up of wealthy minorities who would be presumed conservative tend to be liberal instead. Since Lenski coined the term, status inconsistency has remained controversial with limited empirical verification. 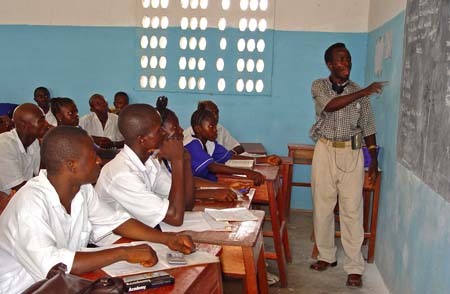 School Teacher: Teachers are often held in high esteem and exert power over students and in local policy, but they tend to have low incomes and little accumulated wealth.